Shola Abidemi Olabode is an early career researcher specializing in digital activism and cyberconflicts. He holds a Ph.D. in Media Studies from the School of Education and School of Social Sciences University of Hull where he also served as Tutor of Media Movements and Radical Politics. This paper examines the use of information and communication technologies by the Boko Haram Islamist movement. While scholarly research on Boko Haram has developed in the last few decades, there is still a lack of research relating to crucial aspects of the conflict including the insurgents’ increasing uses of ICT. This paper uses the Cyberconflict conceptual tool to understand Boko Haram’s use of ICTs and contends that the use of digital media is particularly instrumental in the movement’s guerrilla-style warfare. Salient attributes of Boko Haram’s digital culture includes the use of the ICTs for information sharing, propaganda and psychological operations. Specifically, the study employed a qualitative approach relying on desk-based research, a combination of primary and secondary data and thematic analysis. Boko Haram translates as ‘Western education is forbidden’, and was a popular tag given to the group by civil society actors and media stakeholders in Nigeria due to the movements largely anti-western stance. Originally, the movement described itself as Jama’atu Ahlis Sunna Lidda’Awati Wal-Jihad meaning ‘People Committed to the Propagation of the Prophet’s Teachings and Jihad’, and it has criticised being called Boko Haram. The group’s evolution has raised curiosity as there is yet to be a consensus on the circumstances surrounding the exact date the movement emerged. Some theorists have historically linked the evolution of the group to the other previous jihadi insurrection in Nigeria. For instance, the Maitatsine uprising of the 1980s is a crucial example of a jihadist ethnoreligious conflict that can be juxtaposed with the Boko Haram insurgency especially regarding the group’s violent militancy (Ayelabola 2013; Aghedo and Osumah 2012; Adesoji 2011; Danjibo 2009). Ayelabola (2013) explained that the Maitatsine was an anti-modernist movement that went on a rampage in Kano state in 1980 under the leadership of Mohammed Marwa. In the ensuing conflict, over 4000 individuals lost their lives, and hundreds of buildings wrecked in the eleven days of the conflict (Ibid; 114). The Boko Haram conflict has claimed even more lives in over a decade of war against the Nigerian state. As at 2012, The Nigerian Security Tracker, a project run by the Council on Foreign Relations, reported over 20,000 deaths in connection to the Boko Haram insurrection in Borno state in North-eastern Nigeria. Some scholars have linked the group’s development to historical events as in the case of the Maitatsine uprising of the 1980s. Adesoji (2011) historically connects Boko Haram’s ideology to Mohammed Yusuf’s father, who, as far back as the 1960s had been a staunch opponent of Western education. This trait is particularly evident in the narratives of the Boko Haram under Yusuf and subsequently Abubakar Shekau. The causal link demonstrates deeply sited grievances that predates current events of Boko Haram. Nonetheless, the lack of agreement on the emergence of the movement reveals the difficulty in understanding the dynamics of violent insurgency and conflict groups. The reason has been that such movements are mostly inherently covert due to their reliance on guerrilla warfare. Nonetheless, with varying perspectives emergent within political and social commentary in the media, and scholarly studies on Boko Haram, it is possible to trace the movement’s development as a contemporary religious movement to 1995. Boko Haram existed under various manifestations dating from 1995. For instance, the movement took on the identity of a religious youth organisation, Ahlulsunna wal“jamaah“hijra (Shabaab Muslim Youth Organisation) in 1995 in Borno State Nigeria (Ayelabola, 2013: 118). At the time, Abubakar Lawal, a Muslim cleric in the city of Maiduguri (Aghedo and Osumah 2012: 585), led the youth organisation. The association of Boko Haram to the youth organisation is perhaps the earliest record the movement likened to a civil society organisation under Lawal. The group’s metamorphosis to Jama’atu Ahlis Sunna Lidda’Awati Wal-Jihad alias Boko Haram emerged under Mohammed Yusuf who took over the group between 2002 and 2009 (Ayelabola, 2013; Adesoji 2011). The movement gained international notoriety in 2009 following clashes with security operatives, which led to the arrest and subsequent extrajudicial murder of Mohammed Yusuf, the leader of the movement. After Yusuf took over, the campaign experienced radical changes and took an aggressive stance on Islam and politics in the years that followed. In particular, the group took a firm position on political Sharia, which in simple terms refers to the ‘religious law of Islam’ (An-Na’im, 2008: 1). In a political sense, Boko Haram actors seek to enforce Sharia as the principal means of governance across the Northern region of Nigeria and indeed other parts of the country. Radical insurgency tactics and violent extremism have chiefly accompanied their strong stance on Sharia. Growing suspicion of the group’s secret jihadist plans and confrontations with the police at different times prompted an onslaught by the security services on the group which resulted in the arrest of some of its members and a raid on the group’s haven (see Walker 2012: 3). In 2003, following public disagreements over rights to a local fishpond, the movement overpowered the police in the ensuing confrontation and seized the weapons of the police officers caught up in a frenzy. This clash highlighted the group as a significant threat to peace and stability. Security services, involving a joint operation between the police and military, subsequently besieged the group’s mosque. In the onslaught that followed, Adesoji (2010: 98) explained that nine members of the Boko Haram camp were apprehended and dangerous machinery confiscated. Reprisal attacks from the group resulted in the capture and subsequent death of Mohammed Yusuf in 2009 (McConnell 2009; Adesoji 2010; Onuoha 2010; Hines 2009). Following a lull, Boko Haram re-emerged in 2010 under the leadership of Abubakar Shekau who has since led the most offensive and ongoing violent onslaught against the Nigerian government (Walker 2012: 5). Also, the group has targeted ordinary citizens, expatriate workers, media houses and practitioners, Muslims and Christians (Ayelabola, 2013; Agbiboa, 2013; Chothia 2012; Onuoha, 2010; Walker 2012). While the group’s insurgency has been mainly in the North Eastern region, there have also been with sporadic events across other geopolitical areas in Nigeria. To articulate the general workings of Boko Haram especially as it relates to the organisational aspects of the groups uses of digital media, what follows is a discussion on the conceptual premise that informed the study. In its original conception, the Cyberconflict framework provided an analytical approach for considering conflicts supported by ICTs and occurring in cyberspace, during the pre-social media era (pre-Facebook 2004, YouTube 2005 and Twitter 2006) of digital media expansion. The framework helped in the examination of protests emerging online and transferring to real-life settings and vice versa between 2000 and 2005 (Karatzogianni 2012: 3). The frame subsequently became instrumental for articulating conflicts in the social media era (Karatzogianni 2009, 2012a, 2012b; Karatzogianni et al. 2017). The Cyberconflict conceptual framework ties to the principle of computer-mediated communication CMC (Karatzogianni 2006: 94). The thrust of the framework is to consider how ICTs serve as either resource or weapon in both online and offline propaganda conflicts between the state and political protest movements (Karatzogianni 2012: 1). 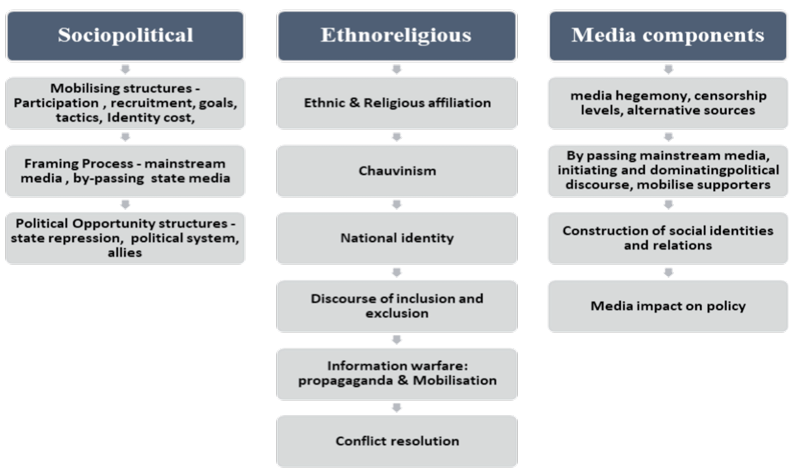 For a concise description of disputes, the Cyberconflict approach sets the debate on computer-mediated conflict around two broad categories of conflicts that occur in the global landscape: sociopolitical and ethnoreligious. To be clear, sociopolitical Cyberconflicts (Karatzogianni 2006) encompasses conflicts as in the case of anti-globalisation, anti-capitalist and anti-war movements and the effect of ICTs and the internet on their activities. Sociopolitical and economic inequalities and deficits in civil and political rights are usually characteristic of the struggle of such groups. The Zapatista movement of Mexico, the anti-globalisation and Occupy movements and the Arab uprising provide illustrative examples of sociopolitical Cyberconflicts. For the other type of conflict which Karatzogianni (2006) classifies as ethnoreligious Cyberconflict–as the name suggests, these are mostly ethnic, religious and culturally motivated movement in a confrontation with the state or opposition movements. In the Cyberconflict contexts, such contestations evolve in virtual spaces, as they are in typical real-life setting (Karatzogianni 2006: 5). It is crucial to state that the use of the phraseology ‘ethnoreligious’ does not necessarily mean that the conflict of such movements is exclusively ethnic and religious. Such affiliations exist, yet, the interests and struggles of the same movements could survive together with other socio-political and economic motivations. The Cyberconflict framework provides a useful instrument for examining sociopolitical movements that adopt peaceful and non-violent strategies and ethnoreligious groups who opt for violent militancy conflict tactics. Therefore, the framework’s tripartite structure, which ties together the elements of distinct theories to articulate contemporary types of conflict and the impact of ICTs enriches our understanding of both sociopolitical and ethnoreligious conflicts. The diagram below summarises the nexus between aspects of the Cyberconflict framework and ICTs. This model is crucial as it enables the study of the origins, development and demise of conflict movements among other characteristics (uses of ICTs). The conflict theory, like the SMT, is used to examine ethnic and religiously motivated movements, violent conflict, and culturally motivated protest groups. The framework demonstrates how ICTs serve innovative purposes as tools and resources to facilitate the activities of conflict movements. For instance, about mobilising structures in the diagram above, the ICTs play a role in helping to boost participation levels, recruitment and enhance the goals of the movement (Karatzogianni 2006; Garret 2006; Meier 2011). Similar connections exist between ICTs and framing processes and opportunity structures. The Arab Spring between 2010 and 2012 and the Occupy movements provide some illustrative examples of conflicts where ICTs served as a resource and played a facilitative role especially for mobilisation (Karatzogianni 2012; Castells 2011; Meier, 2011). Regarding ICTs as a weapon in ethnoreligious Cyberconflicts, we can see ICTs as a terrain for conflict in the India-Pakistan conflict between 1998 and 2003, Israel-Palestine 2000, and China-U.S 2001 Cyberconflicts (Karatzogianni, 2006: 344-352). In these examples, the internet was the primary site of contestation. Rival parties in conflict employed hacktivism, i.e. (website defacement, trojan virus, disruption of service to mention but a few). Also, armed insurgency and radical groups have also adopted the ICTs as tools in their rebellion. Al-Qaeda, which John E. McLaughlin a former CIA director labelled as driven mainly by ‘ideology and the Internet’ is an illustrative example. The internet’s amorphous and borderless structure fits well with the tactics of such groups, and we can see new Islamist sect like the Islamic State in Iraq and Syria (ISIS) and for the present study, Boko Haram exploiting the benefits of ICTs to facilitate their operations. The study principally relied on secondary data and some primary data online sources. These include online textual and audio-visual materials available on the movements online. The primary source of data collection included a selection of online news reports from mostly Nigerian online news media and a few global media sources online. The choice of mainly Nigerian media sources was because the media organisations operate in Nigeria and they provided a diverse array of perspectives, interviews and opinions on the movements. For example, online news sources provide commentaries from movement actors, the government, civil society stakeholders, security experts, and ordinary Nigerians. More so, media reports examined also provide up-to-date information and insights into the activities of Boko Haram. In total, five Nigerian newspapers online were identified and selected for analysis. Vanguard Nigeria and Premium Times were selected based on a simple Google search in which, for instance, Vanguard Nigeria and Premium Times Nigeria came top in the list among Nigerian online news sources concerning specified themes. For example, in search for the topic ‘Boko Haram news’, the aforementioned online media appeared in the top of news items on the subject. The interactive approach of the two sites, which allows for commentaries and a forum for discussion among participants, also informed the choice of the sites. Also, the researcher had followed political commentaries on the movement on the two sites between 2014. Across these five online media portals, 75 reports focusing on the Boko Haram were selected and examined to cover the period between 2006 and 2014. This specific period was chosen to reflect the structural dynamics in the origins, development and advances of the respective movement and due to some important events that took place within these periods, most importantly the mutations in the movement’s tactics and strategy. The rest of the paper discusses Boko Haram’s uses of ICTs. The last few decades have seen an upsurge in the use of ICTs, the Internet, and social media among conflict movements across the globe. Over the years, ‘right-wing militias in the USA, Islamist opposition movements originating in the Middle East and single-issue pressure groups such as environmental activists or human rights campaigners’ (Rathmell 2000: 230 cited in Karatzogianni 2006: 22) have used the internet and ICTs as a medium to augment their activities. Similarly, ‘many insurgents, from the provisional IRA through Mexico’s Zapatistas to Lebanon’s Hizbollah, have incorporated ICTs into their more traditional propaganda and fundraising activities’ (Karatzogianni 2006: 22). Other’s more sophisticated, have employed new media and in particular the internet as a weapon as in the case of hacktivism. Regardless of the institutional, structural, national, philosophical and systemic differences that exist between such radical movements, such ‘groups have been quick to exploit ICTs for propaganda and psychological operations’ (Rathmell 2000: 230). These are two fundamental dynamics explored by insurgency and radical movements in contemporary times. In the Boko Haram context, information sharing emerged as the major component of the groups ICT use, nonetheless, as will be subsequently demonstrated, a scrutiny of the contents and framings of the movement messages conforms to the two dynamics identified by Rathmell. A salient characteristic of Boko Haram’s media use is the constant shift and adoption of different media. The group’s media strategy metamorphised over the years. We see an incrementally change the Islamist’s tactical repertoire from using old traditional media (the face-to-face communication and the uses of pamphlets, video recordings delivered to media houses) to new media tactics, which included telephone conversations with media houses to YouTube video postings and social media. As opposed to hacktivism which deploys the internet as a weapon, Boko Haram largely depends on digital media (the internet, ICTs, and social media), as a resource to advance its ideology and mobilisation. The conclusion here is informed by video postings of the movement, which helps to shed light on the purpose and objectives of ICT uses. For the hacktivist, the internet is the central terrain of conflict, however, in the present context, Boko Haram uses of ICTs does not include elements of hacktivism. Indeed, the Boko Haram movement employs digital media to mobilise and recruit its members. The use of ICTs in the latter is less clear and perhaps not as compelling as other mechanisms like face-to-face recruitment, the impact of kinship, peer pressure and the use of coercion in enlisting child soldiers and youths. For instance, one of the members of the movement interrogated by security operatives claimed he had been coerced to join the group (see. ENDS.ng. 23 September 2015) yet, new communication media have played an influential role in the group’s mobilisation. Connell (2012) explained that, over the years, the deployment of new media technologies surfaced in the movement’s tactical repertoire. For instance, internet forums became an avenue to expand and recruit adherents (Connell 2012, 89). It was these practices, in particular, the uses of online media among the leadership of the movement that informed the Nigerian government’s decision to shut down networks of communication in three states (Maiduguri, Adamawa, and Yola), three of the most affected states in the movements guerrilla-style warfare. The leader of the sect, Abubakar Shekau has exploited the internet to post several videos produced by the movement which ended up being rebroadcast on the YouTube platforms of media houses and by individuals. The medium serves as a haven from which the leader of the sect called for support and specific action from loyalists both in Nigeria and abroad. For instance, in one of the group’s videos published by The New York Times (2014) the sect leader, after criticising world leaders orders his followers ‘kill, kill, kill, kill, kill, kill’ referring to mainly Christians in Nigeria. In another video, towards the end of his speech, Shekau issues a call to action. According to him, ‘my brethren wherever you are, in Abuja, Lagos, or the south-south, wherever you are, commence attacks. Even as an individual, take up your swords and slaughter anyone you come across in his sleep. My brethren, take up knives and start slaughtering people. Just pick up your knife and break into homes and kill’ (Audu 2014). Such calls to action have proven to be a call towards self-radicalisation especially for sympathisers across the country who may agree with the activities of the group, but (a) have no direct link to the leadership of the group (b) lack the psychological motivation to participate in the conflict. In this regard, one could link some of the spontaneous attacks in different regions of the country to the chilling effect of such instructions for which the group has claimed responsibility. The belief is that not all cases of individual suicide attacks, bombings and kidnappings can be directly linked to Boko Haram since the movement’s leadership does not have direct contact with individuals in the different regions. We may only attribute to some unified ideology or shared goal among the Islamist’s, which Boko Haram leverages on in videos posted on the Internet via YouTube to motivate, manipulate and encourage adherents to act. Consequently, the video posting and messages propagated in those videos by the leader of the sect can serve as a self-radicalising mechanism, since the ideologies expressed in them (religious) are meant to gain the minds of sympathisers and adherents of the religion. The chances are that if followers listen to such sermons from the online handles sponsored by the group or YouTube broadcasts some fundamentalists could be caught up with the messages of Boko Haram. There is growing evidence to support the notion of self-radicalisation online (Onuoha 2014; Ibaba and Okoye 2017). Although the previous point is difficult to verify, nonetheless, one can assert that, as in the case of face-to-face radicalisation, the internet can replicate similar attributes. About the rise of ISIS since 2014, media commentary and political rhetoric demonstrate how the internet has become a haven for recruitment (see. Gilsinan, 8 December 2015). The networking factor played a role in the Nigerian government’s decision to shut down mobile networks, including internet service in the region. In a 2013 Daily Times report online, a top security official, while commenting on the telephone shut down, argued that the networks were suspended as part of an approach to demobilise Boko Haram. While the belief was that shutting communication networks will slow down the activities of the movement, the strategy proved ineffective as movement actors found alternative ways to bypass the limitation (censorship) on ICT platforms. The structure of the internet itself presents a haven for insurgents to facilitate their activities, from organising, and recruiting members, to mobilisation, and coordination. For this school of thought, ICTs disregard conventional modes of media and warfare that can make insurgents’ activities easily predictable and as such monitored by the state. Digital media have provided a window of influence in the circle of global jihad for Boko Haram insurgents over the years. One could safely assert that the movement’s exposure to the activities of other jihadist movements across the globe played a role in shaping the general workings of the movement. Such exposure is only possible with modern technologies of communication, and there is a reason to believe that Boko Haram has leveraged such technologies. Besides self-radicalisation within the movement, the group has used the medium to build networks with its contemporaries across the globe, training, especially as seen in the evolving tactical repertoire of the group that has changed continuously. Upon setting up its Twitter handle, some political analysts and commentators (BBC Monitoring, 4 March 2015; Cummings, 13 March 2015) were of the assumption that ISIS may be managing the Boko Haram public relations campaign, given the similarity between the group’s latest drives to that of ISIS. More specifically, the influence of global jihad movements on Boko Haram given the impact of ICTs and the Internet has been consistently demonstrated by the aspiration of Boko Haram to carry out the objectives of the Taliban or Al-Qaeda in Nigeria. As a result, some commentators have termed the group the ‘Taliban’ or as some others have ‘the Al-Qaeda of Nigeria’. Following the death of Yusuf, the new leadership under Shekau vowed to carry out the goals and objectives of Usama Bin Laden in Nigeria (Vanguard 14 August 2009). As suggested in the report of the U.S. House of Representatives Committee on Homeland Security, Subcommittee on Counterterrorism and Intelligence, members of the insurgency movement (Boko Haram) use internet forums to lobby and garner the sympathy and support of global jihadist organisations that are structured in other countries (Taliban/ Al-Qaeda). These global Jihadist organisations have a track record of providing support to local and regional jihadist movements regarding training, funding, and procurement, technical and tactical know-how. In this context, careful observation of Boko Haram’s modus operandi, tactical repertoire, and organisational set-up reveal a resemblance to popular jihadist and terrorist organisations across the globe. The movement operates using similar methods including kidnappings and the use of improvised explosive devices, also known as IEDs, in Afghanistan, suicide bombings, extrajudicial killings, and hostage taking. Boko Haram has also targeted attacks at international diplomat buildings in Nigeria, which reflects the group’s grievances towards Western influence and presence in Nigeria. In virtually all online videos of Boko Haram in which Shekau has appeared over the years the trail reveals a penchant for using ICTs for information sharing. The usual claims of responsibility for attacks carried out by the leaders of the insurgents are one illustrative example. For instance, in a recent video surrounding the abduction of over 200 girls from the school in a local community in Maiduguri, the leader of the movement is pictured in a video, where he, in his usual trend, claims responsibility for the abduction (see SaharaTv 5 May 2015). In the same video, the leader of the movement warns the public of the movement’s next line of action and targets of its assault which include Christian and Muslim infidels. Furthermore, while justifying its initial attack on some media organisations, Shekau in another video (Alhaji Mani, 1 May 2012) circulated on YouTube promises to attack some other newspaper houses in Nigeria (including an online media owned by a Nigerian in New York, Sahara reporters). In the video, Shekau provides details regarding why the movement will attack the media organisations in addition to other targets, including Christians, and a Nigerian woman who, according to Shekau blasphemed against the prophet Mohammed in 2002. In 2002, the country was thrown into conflict while hosting the Miss World beauty pageant, following claims of blasphemy against the Prophet Mohammed by a Nigerian woman (see. Isaacs and Butcher 23 November 2002). The movement uses such avenues created by ICTs as a means for advancing their propaganda. One of the critical dynamics of the debate on Boko Haram’s public relations is that the movement in most cases fulfils their promises by attacking its targets, which suggest weakness on the part of the government to respond to such intelligence. For instance, in 2014, a few weeks after Boko Haram issued a warning to the Nigerian government of its impending attack on schools, over 290 female students were kidnapped from their school in Chibok, a remote town in Maiduguri (see. TRAC Nigeria, April 19, 2014). The attack was in protest of girl child education. The movement has been critical of women’s roles in society. Students kidnapped were mainly girls preparing for their senior secondary school examination. While some of the girls have since secured their release, many remain unaccounted for as at the time of writing (Tukur, 2017). Subsequently, a new video was published by the movement, in which Shekau again, claims responsibility for the abduction and restates his intention to sell the girls in the market (see Saharatv, 5 May 2014). Besides sharing information, careful consideration of the messages in videos produced by the Boko Haram movement reveals how the information the insurgents disseminate serves as an informative guide and instruction manual for members of the movement across the country. Sequel to the point of mobilisation, it can be argued that the information contained in the speech of the sect leadership published either by the media or by the group itself provides its network with updates. These include the sect’s next line of action, from instructions, and strategies, to targets and their general modus operandi. For instance, in the video where Shekau the sect’s leader claimed responsibility for the attack on the Giwa Barracks in Maiduguri, he implores and instructs adherents of the movements across Nigeria to kill non-believers, in his words: ‘Brethren, wherever you are, I pray this cassette meets you well. I give you the go ahead, whether you are two or three, take up your weapons and start killing them… kill kill kill, slaughter them, but do not eat, spare the old, women, children, the mentally unstable and those who repent. All those who refuse Allah kill. Not following the religion is a sin and against Allah… kill kill and kill that is the information for today’ (Audu March 2014). A few weeks later, there were two serial bombings in Abuja the Federal Capital Territory where no less than about 70 ordinary citizens lost their lives with severe damage to properties worth millions (The Guardian, 2 May 2014). In the usual tradition of the movement, Shekau in another video claimed responsibility for the attack. A 2015 African Independent Television (AIT) report corroborates the point on Boko Haram’s propaganda, media and psychological operation. The report details the alleged arrest of the Boko Haram’s ICT expert who is suggested to have been in charge of designing computer images, website, and providing internet accesses for the group. The report also demonstrated that such expertise enhances the movement’s media and psychological operations (AIT 2015). The instruments of propaganda, media, and psychological operations are crucial to the success of actions of radical and non-radical conflict groups and the opposition (usually the state, although in the present case it also involves other civil society organisations and individuals the group targets). New media platforms have increased the competition between conflict movements and the state in projecting a superior image of dominance. Conflict groups use new media avenues to engage in psychological operations and propaganda by exploiting narratives that reflect the dynamics mentioned earlier (dominance, superiority especially in creating fear in public). In the Boko Haram context, this strategy has been crucial in the group’s narrative. Its leverage on ICTs to express and construct frame such dynamics of dominance in the conflict has enhanced the groups local and global presence. In other words, new media platforms, the Internet, and ICTs have become the principal instrument to convey the group’s propaganda and psychological operations. For instance, the narratives of dominance and superiority have often manifested through the movement video postings on YouTube, videos sent to media houses which are later published online and, recently, video and images posted on the Twitter handle of the movement. A video posted on YouTube by SaharaTv showing how the Boko Haram insurgents govern their captured territories is particularly telling of how the movement validates its superiority, dominance and creates fear in the public using ICTs. In the video, an unidentified man is buried alive in a shallow grave and stoned to death; another unidentified man has his hands chopped off (SaharaTv, 5 October 2014). The sect takes care in producing the videos to show gory details of their activities. Members are seen hoisting the flag of the Boko Haram sect and jubilant following decapitations and murder of their victims. Besides instilling fear in the territories in which the assailants hold sway, the publication of such videos creates fear in the Nigerian public domain. In the same video, other victims of the group are assaulted. This way the movement demonstrates how it is in control of its captured territories. Having shot down a Nigerian fighter jet and captured a Nigerian Air Force pilot, another video emerged online. The video begins with the sounds of a gunshot in the background, music, a voice-over and video images of the wreckage of the jet. A few minutes into the video, surrounded by members of Boko Haram, and the movement’s flag hoisted in the background, the voice-over fades out, and the camera then shows an injured pilot kneeling before the camera introducing himself, his place of assignments and mission. This introduction is interrupted by the commander of the movement with a brief prayer that is followed by a speech. According to him, ‘God has made a covenant with us that infidels will not have victory over us, and he has a covenant with us that we will always have victory over them, in spite of their strength and might… this is a message to the entire world. As he stated, he is a pilot of the Nigerian Air Force… God gave us victory, and we brought down their jet. Here also lies the pilot we captured.’ In the same video, global leaders and the Nigerian president (as at the time of writing) receive threats ‘we would do to you what Allah has prescribed for you’, and then the pilot is hacked to death’ (See Boko Haram Militants Behead a Nigerian Air Force Pilot 2014). Similar beheadings of those considered infidels by the group have been posted online, especially on YouTube. There are reasons to believe that, such postings have had a great deal of psychological effect on the Nigerian public and the Nigerian armed forces executing an offensive against the group. Media reports have revealed scenarios in which Nigerian troops had abandoned the fight, escaping the insurgents. For instance, in a 2014 Telegraph United Kingdom report online, key public figures in Nigeria had expressed disappointment over the failings of the military. The document, while quoting a top Islamic cleric in Nigeria explained that ‘Soldiers take to their heels and abandon their bases, arms, ammunition and other military hardware on the approach of the insurgents... Nigerian Security Forces only surface after the deadly attacks and terrorise an already terrorised people by installing roadblocks and searching homes’ (The Telegraph 25 November 2014). Shekau also made similar claims. Referring to weapons seised from the military, in a YouTube video, the sect leader claimed that, ‘the war equipment that you see on display on the screen are from Baga and Doro. Your army kept deceiving the world that you can’t fight us because you have no arms. Liars! You have all that it takes; you are just coward soldiers’ (Audu 2015). The propaganda and psychological operations of Boko Haram account for one reason for low morale on the part of the Nigerian military. Other reasons for the lack of confidence, as argued by some military officers, tie to issues of corruption within the military (misappropriation of funding meant for officers and lack of proper machinery to prosecute the battle to mention but a few) (Ibekwe 2015). Sequel to the idea that the leadership of the movement uses its sermons in mosques to construct anti-nationalist, and anti-Western ideologies embedded in a religious guise, these messages have emerged on YouTube and have been instrumental in expressing the ideology and other propaganda of the movement. A careful consideration of the Twitter handle of the group reveals a salient characteristic of the movement’s manipulation and psychological operation. For instance, there are images of child soldiers posted on the site. In reality, the use of child soldiers and women as shields can be seen as a tactic to slow down the military onslaught on the movement. This approach distracts the military and the government who know that various human rights issues had already tainted the military’s image in their prosecution of the war against the insurgents. The forceful enlisting of children into the army of the insurgents will make it difficult for the military to confront the sect in view to avoiding further human rights backlash. Also, the use of children demonstrates the reach and doggedness of the group. Again, relying on the ideological propaganda of religion which the group has consistently exploited, the text above extracted from an audio message broadcasted on the internet from Boko Haram to ISIS demonstrates another salient feature of the group’s propagandist and psychological operations, in its strides to connect with other jihadist movements across the globe. Shekau bases the movement’s move towards allegiance on the Quranic provision that every Muslim must have a leader or risk dying, which implies that the movement was struggling with the conflict. Arguing that Shekau was exploiting religious texts for manipulative gains, a prominent rights campaigner explained that Boko Harams’ message indicated a stronger ideological philosophy compared to previous messages and suggested that the government should exploit superior Islamic texts to counter the insurgent’s psychological operation (World Bulletin 2015). Another striking feature of Boko Haram since its inception is about the efforts to link up with similar jihadist movements directly and indirectly. This drive shows the group’s quest to situate itself as a global player, especially within global jihadist circles. Before the evolution of ISIS, Boko Haram has made efforts in their (Shekau) speech, to connect to other similar movements. For instance, in one of Shekau’s statements, he pledges that Boko Haram will carry out Usama Bin Ladin’s goal in Nigeria. While such acts demonstrate Boko Haram’s loyalty to global jihadist movements (from Al-Qaeda and the Taliban to ISIS), it also paints a scenario indicating some working relationship between Boko Haram and Al-Qaeda even though there is no sufficient evidence to suggest how (if at all) these groups work together. Following Boko Haram’s declaration of allegiance to ISIS, the Islamic State through its spokesperson responded by accepting Boko Haram’s loyalty in a similar audio message, which also circulated on the internet. The tactic is of crucial significance to Boko Haram’s struggle to assert hegemony, especially in the face of the ongoing onslaught on the movement. For instance, Boko Haram’s most recent pledge of allegiance came in the wake of the regional military attack on the group which has dislodged them from their haven. Besides establishing itself as a global jihad player, the move to ally with global jihad groups helps Boko Haram maintain a greater sense of meaning and relevance among its supporters, members, and sympathisers at home and abroad. While in the face of conflict, morale among adherents may gradually fade out; the global allegiance may serve as an instrument for attracting more members mainly from the supporters and sympathisers of global jihad movements (Moftah 2015). One point to note, however, is again how the movement uses religion as the basis for such alliance. Nonetheless, if successful in its propaganda, the assumption is that this tactic will be instrumental in recruiting more individuals into the group. Experts and political commentators have argued that Boko Haram uses global jihadi groups to boost its recruitment drive (Matfess 13 March 2015; Moftah, 3 October 2015; Tisdall 8 March 2015; News24 3 September 2015). The move could also have other positive effects on the Boko Haram movement, especially regarding global jihadist groups providing training and funding to support Boko Haram activities in Nigeria (Matfess 13 March 2015). According to a 2015 World Bulletin report, the alliance between Boko Haram and ISIS will pose further threats to a country already struggling to grapple with increasing insurgency activity. The report hinges its assertions on the belief that, with the more sophisticated and better funded ISIS, Boko Haram stands to benefit from ISIS’s strategic planning capacity, including a better public image from the movement’s sympathisers across the globe. As it were, ‘it appears that they are getting more recruits by the day… the alliance with ISIL had been expected since Boko Haram had in the past made veiled comments to this effect. The statement is a way of saying yes, we have expanded the scope of our operations and ideology and… foreign support’ (World Bulletin report 2015). By considering Boko Harams use of ICTs, we can underscore the movement’s strides to get its message to different audiences and contend with competing narratives on its activities. Boko Haram is not the first group that uses ICTs as part of its tactical approach, as demonstrated groups like Al-Qaeda led by Usama Bin Laden used the internet and more recently, ISIS. It is safe to argue therefore that there is a transnational influence on the activities of conflict movements of this nature. Such effects have been occasioned by the window of opportunity created by exposure ICT. Following this belief, Boko Haram’s exposure to activities of similar groups across national boundaries via ICTs has helped the organisation situate its operations within global terrorism. The alliance of Boko Haram to Al-Qaeda and subsequently allegiance to ISIS bear testament to this point. Ultimately, we see a growing trend in the use of ICTs by conflict movements in this category mainly because the tools fit well with their covert operations and guerrilla-style warfare. The study found that Boko Haram relies on ICTs for information sharing, psychological operations, and propaganda activities, which are challenging for the government to manage in the digital age. Shola Abidemi Olabode is an early career researcher specializing in digital activism and cyberconflicts. He holds a Ph.D. in Media Studies from the School of Education and School of Social Sciences University of Hull where he also served as Tutor of Media Movements and Radical Politics..
Ibaba, S. and Okoye, A. (2017) Mopping the Wet Floor of a Leaking Roof: Fighting Terror While Overlooking Radicalization. In: Hentz, J.J. and Solomon, H. (eds.) Understanding Boko Haram Terrorism and Insurgency in Africa. London and New York. Routledge. Karatzogianni, A. (2006). The Politics of Cyberconflict. London and New York. Routledge. Matfess, H. (March 13, 2015). How the ISIS-Boko Haram Alliance Will Alter Nigeria’s Future. Retrieved from: http://www.defenseone.com/threats/2015/03/how-isis-boko-haram-alliance-will-alter-nigerias-future/107484/. Moftah, L. (March 3, 2015). Boko Haram ISIS Pledge: Possible Alliance Would Reap Limited Victories For Militant Groups. Retrieved from: http://www.ibtimes.com/boko-haram-isis-pledge-possible-alliance-would-reap-limited-victories-militant-groups-1842568. Onuoha, F. C. (2012). Boko Haram: Nigeria’s extremist Islamic sect. Retrieved from: http://studies.aljazeera.net/ResourceGallery/media/Documents/2012/2/29/2012229113341793734BOKO%20HARAM%20NIGERIAS%20EXTREMIST%20ISLAMIC%20SECT.pdf. The Guardian (no date). Breaking News: Boko Haram threatens to attack VOA, Guardian, Daily Trust others. Retrieved from: http://www.premiumtimesng.com/news/4895-boko_haram_releases_video_on_thisday_bombing.html. Tisdall, S. (September 3, 2015). Boko Haram-Isis alliance is nothing but superficial propaganda. Retrieved from: http://www.theguardian.com/world/2015/mar/08/boko-haram-isis-alliance-is-nothing-but-superficial-propaganda. Walker, A. (2012). What Is Boko Haram? United States Institute of Peace. Retrieved from: http://www.usip.org/sites/default/files/SR308.pdf.